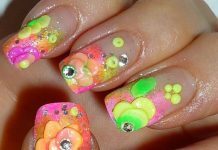 In this website, we already showcased a lot of nail art designs that are painted on nails. We also occasionally mention that some of the designs are accessorized to create more levels and intricacy. Now, these accessories could just be glitters or stickers that can be stick unto the nails but they can also be much more. Imagine jewels, plastics, and fabrics—yes, these things can now be used as design materials to make a 2D nail surface become a 3D art masterpiece. 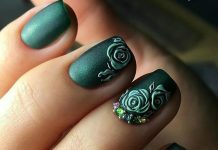 3D nail art may probably not be a good day-to-day nail art choice because it is almost impossible to use your fingers without damaging the designs but it’s something worth trying for the sake of curiosity, experience, and fame. 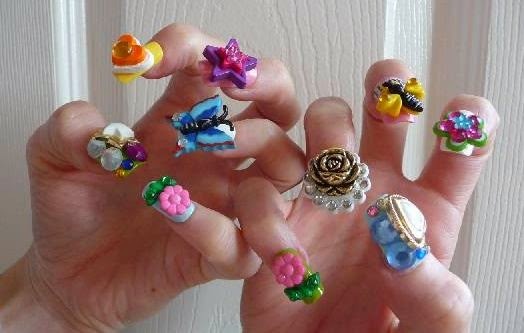 Today’s collected samples offer a wide range of designs wherein nails are accessorized like crazy. Some bear flowers while others have patterns made of pearls, crystals, and gems. There are cute designs made from fabric paint, colored glue, and even plastics and glass. 3D designs take a lot of time to put on and perfect so for those who are planning to be accessorized, prepare yourselves for hours of decorating and curing. As difficult it is to create the 3D nail art designs, it is also not an easy task to protect the finish products from bumps, damages and accidents. For those who dared, be cautious in every move you make to make sure that your awesome nails will last. No need to worry though, the effort will certainly reward you back with good impressions as quick as switching the lights on.